Andrew started PreK-3, this week!! :) He was (and still is!) so excited about school! The night before we got ready by reading a few "back to school" books. Of course, like last year, we read The Night Before Preschool! We also read If you Take a Mouse to School and The Mine-O-Saur. Jason read Andrew and Alex the mouse book while I was getting their treats out. 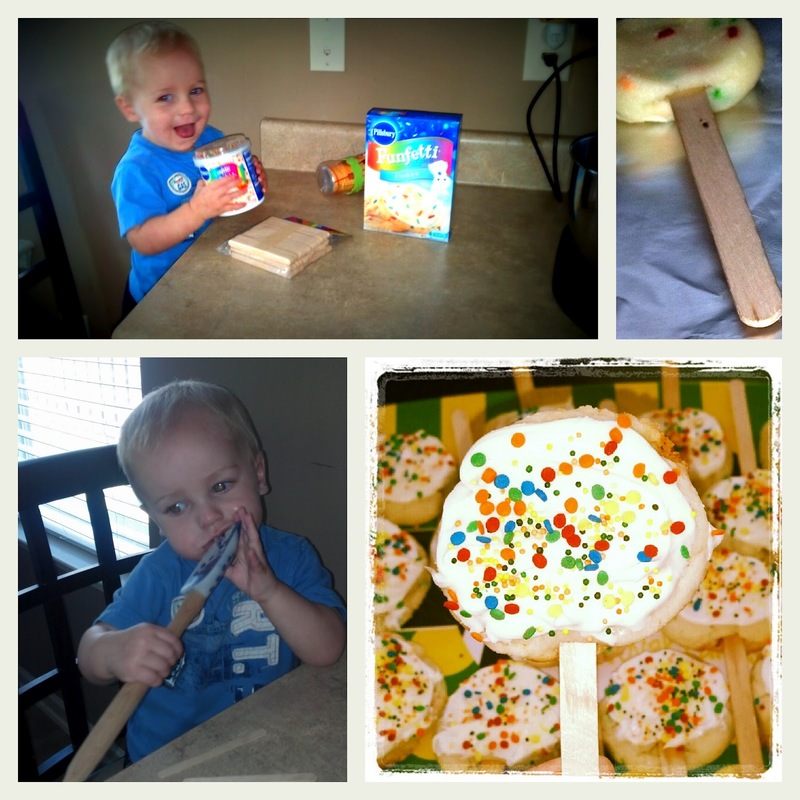 I made rice krispy treats for every one - yum! Looking for his teacher and friends. Alex and I went to get a goodie and coffee at Starbucks. Alex wasn't too interested in it...he was trying to figure out where Andrew went. I told him he went to school. He said, "Coo?" And, then got a little bit sad. Poor guy misses his buddy. While those were baking, Alex worked on some school work of his own. This week I am introducing the ABCs to him. I wish I had gotten pictures of what we were doing, but he was so involved and interested in school stuff like Andrew, that I didn't want to interrupt. I'll definitely get some next week when we do the letter A. I am following the lesson plans from Totally Tots - "Now I Know My ABCs." I love their website!! We are also working with our Leap Frog Fridge Phonics, too. We had just ABC out this week, but next week the letter A will be out only. As you can see, the shoes never went on either.. And he is he asking where "And go?" This is the sweetest thing EVER. Andrew got to pick a prize from the treasure box and he wanted to share it with Alex. LOVE IT! Lunch at the playground - so happy that this weather has been AMAZING these past few weeks. We were out he until nap time! It was a great start to a great first week of school for Andrew (and Alex!). The first day, Alex was upset that Andrew left. The second day, Andrew was so sad that Alex couldn't come to school with him. I wonder what will happen next week.